Note: Only possible for sites with a connected domain. Click here to go to your WIX dashboard. Click Manage Website in the side. 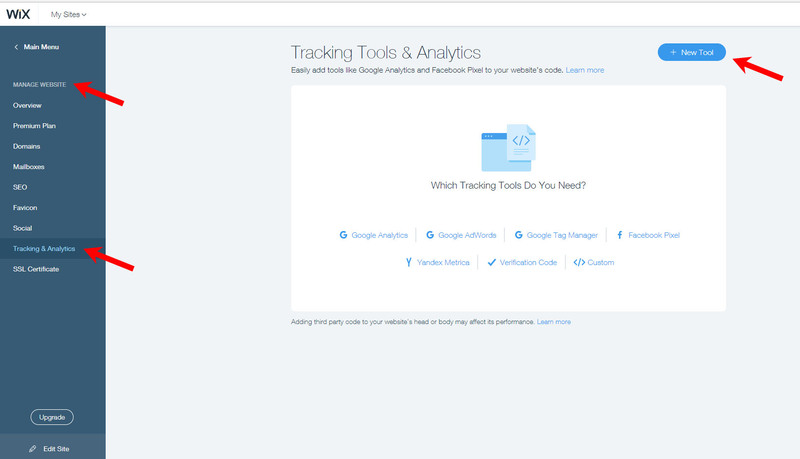 Go to the Tracking & Analytics section of Site Manager. Click + New Tool and select Custom from the dropdown. Enter your secure privacy code into custom code. Note: This option will appear only if you have multiple domains. Enter the name of the custom code (Secure Privacy). Add Code to Pages: Select All pages > Load code on each new page to add your code.